There are many brands and types of deck finishes, but none is perfect for all situations. Ask neighboring deck owners what they’ve used to keep their decks looking good, and how often they apply it. Also, research the pros and cons of different ingredients before choosing the finish for your deck. The tips below should help. The many deck finish products basically are different combinations of a few ingredients: water repellent, resin, preservative, and/or UV blockers, absorbers, and inhibitors. Less expensive products usually contain fewer and lower-quality ingredients and perform less well. Most products will need to be applied every year or two, depending on your climate and how much the deck is used. However, some higher-end finishes have proved more durable and typically last four years, even in regions with harsh weather. Their success lies not in the type of ingredients, but in how well they penetrate the wood. The more they soak into the wood, the longer the finish lasts. Though strong and long-lasting, polyurethane and varnish are not recommended for decks because they form a hard, inflexible surface film. When deck flooring moves due to moisture and temperature changes, this film will crack and may even flake. Once that occurs, you’ll need to completely strip the old finish and apply a new one. Polyurethane and varnish also do not protect against the sun's UV rays, meaning that your wood will turn gray. Moreover, once the surface cells have been destroyed by the sun, the finish will flake off because it has nothing to adhere to. A good deck finish will repel water while remaining flexible enough not to crack. 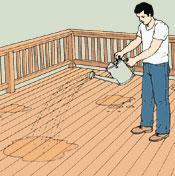 Most deck finishes repel water with paraffin and/or oil (either tung oil or linseed oil). The finish is manifest when water beads after it has rained. Under rainfall and traffic, paraffin and oil finishes will wear out fairly quickly and will need to be reapplied. Alkyd resin is a longer-lasting--and more costly--water repellent which soaks into the wood to seal it from moisture. A heavy dose of resin gives decks a permanent "wet look" that many find attractive. However, it also can impart an amber or yellow cast to your deck. Most preservatives contain a combination of fungicide, mildewcide, and insecticide. All-purpose deck finishes usually contain a mildly protective amount of all three. But if your area has serious problems with fungus, mildew, or insects, you may need to bolster the low-level protection of an all-purpose finish with a separate treatment. If you liked the original color of your deck and want to keep it from turning gray, coat it with ultraviolet protection in the form of UV absorbers and blockers. These solid pigment particles absorb or reflect UV rays to minimize their damage. However, the very pigments that keep the sun from graying the deck will add color to the wood. It doesn't take much pigment to block the sun's rays, so if you choose carefully, your wood's appearance needn't change drastically. But be aware that your wood will not look exactly as it did when you first installed it. Alternatively, choose a more expensive finish containing UV inhibitors compounds which actually disrupt the chemical action caused by UV light. The advantage is that no pigment is required, so you can more nearly retain the original look of your wood. But the sun-protective chemical reactions of UV inhibitors ironically cause them to break down and become less effective. So not only are these finishes more expensive, they are significantly shorter-lived than pigmented UV blockers and absorbers. That means that if you don’t re-apply them often, your wood still will turn gray. Truly clear finishes usually contain a water repellent plus a preservative. Use these if you want your wood to gray. They will hardly change the appearance of your wood (unless they contain resin) and will help your deck last longer than it would without a finish. When staining a deck, you may want to use less-expensive clear sealer for the underside where sun and discoloration don’t matter. Just make sure that no clear finish is sprayed to the topside, where it could change the color of the stain. Some products labeled "clear" actually contain pigments for UV protection, so are not really clear. Others contain UV inhibitors that will keep your deck its natural color without pigment, but only if the treatment is frequently re-applied. Stains may be a solid color, clear, or semitransparent. Semitransparent stains contain varying amounts of pigment but leave the natural grain visible. If they contain resin or a good deal of oil, they will make your deck look wet, so before choosing a stain, notice its sheen as well as its color. Though a second coat will darken the deck, semitransparent stains will lighten over time and must be re-applied. Solid-color stains essentially are thinned paints that let a bit of the wood grain show through. Solid-color stains are designed for siding and are not appropriate for surfaces that are walked upon because they will quickly wear away. For a solid-color deck, porch-and-deck paint is more durable than stain, though it has serious drawbacks. Unlike stain, paint does not soak into wood, but rather forms a thin film on top. It protects the wood it covers, but decks have uncovered places, such as the undersides and edges of deck pieces, that a brush may not reach. Plus, when paint cracks due to the wood's expansion and contraction, any water seeping into the wood is trapped by the paint which then encourages warping, cracking, and rot. Paint can, however, work well on tongue-and-groove deck flooring, since it completely covers the exposed wood. All in all, it's best to use paint or solid stain only on vertical surfaces such as posts, balusters, and skirting that do not endure wear. Brown pressure-treated lumber looks pretty much like stained redwood or cedar. If the color fades over the years, you can restain it using a semi-transparent deck finish. Apply the finish in a small, inconspicuous spot, waiting a few days for the color to settle in before coating the deck with it. Green pressure-treated wood is best left uncoated for about a year to let it gray somewhat. 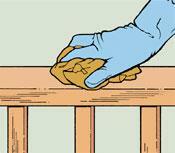 Then apply either wood bleach (oxalic acid) or a product specially made for cleaning pressure-treated lumber. Use a stiff broom or scrub brush to dig out grime. Rinse the deck thoroughly and let it dry completely. The gray will have disappeared and the wood will be somewhat less green than it was originally. To achieve a redwood or cedar color, experiment with light, semi-transparent stains. Products called "toners" are made for this purpose. If your deck is constructed as cold weather approaches, it may be too late to apply the finish, especially as you may need to wait a month for the wood to dry. Finishes should not be applied when the temperature's at or below 40 degrees Fahrenheit. It's okay, however, to leave the deck over winter and stain it in the spring. If some graying occurs, first wash it with wood bleach. When applying a penetrating finish, you want the wood to absorb as much as it can. So don’t hesitate to apply penetrating finish liberally; it won’t leave brush marks because it's absorbed, and excess finish can simply be wiped off. The most common mistake is not applying enough finish to saturate the wood fibers. In fact, end grain (such as the ends of posts or decking pieces) absorbs finish almost as soon as it’s brushed on. Check these spots during application, and re-apply the finish until the wood stops absorbing it. Words of caution: Avoid breathing finish vapors or spray mists. Wear rubber gloves and long-sleeved garments during application to reduce exposure and minimize the chance of skin irritation. Always wear goggles or safety glasses to protect yourself from backspray or drips. Don't wait too long before applying a finish or the deck will become dirty with use and will need heavy-duty cleaning. But it's also a mistake to apply finish to wood that's still green or wet with treatment; the finish will not soak in and won't be effective. For pressure-treated lumber, unless it is kiln-dried after treatment (marked KDAT), it's almost always necessary to wait a month or so before applying finish. Other woods may be ready once the deck is built. Test by sprinkling a little water on the deck (Fig. 1). If it soaks in readily, finish the deck. If it doesn't, wait a week or so (depending on the sun exposure) to test it again. For the smoothest possible finish and one which thoroughly soaks in, sand the whole deck with an orbital sander or a universal pole sander (using 60- or 80-grit sandpaper). 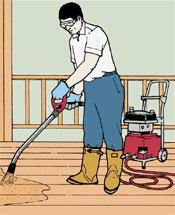 Vacuum the deck, and make sure it is clean--any dirt will be sealed in the finish. Using a deck cleaner will both remove dirt and open the wood grain to accept the stain. Caution: Do not sand pressure-treated wood since the dust can be toxic. Instead, rent a power washer to clean it (Fig. 2). Then allow the deck to dry before applying the finish (two dry, windy days should be enough). Horizontal decking boards can be coated with a roller or spray equipment (small pump-pressured sprayers can be purchased inexpensively at most hardware stores). Follow the sprayer with a brush to spread out the finish. Apply finish to the underside of decking and to joists, beams, and posts. For posts, railings, and stair stringers, brush application is best. Remember that visible end grain will absorb much more than will flat surfaces. With a clean rag, wipe off excess finish that isn't absorbed after half an hour (Fig. 3). Be sure to dispose of all rags properly; the heat generated from evaporating finish can cause rags to ignite. Spread the rags out and allow them to dry completely before disposing of them. If the rags will be re-used, store them in an airtight container.